Joseph Hornacek of Rochester Hills, Michigan, is certainly a man of good humor. He’d have to be, considering that he purchased a disassembled and incomplete barn-find Ford Model A truck and turned it into the pristine vehicle you see here. He needed some of that upbeat mood, plus patience and skill, to see a difficult 10-year restoration through to the end. When Hornacek first saw the truck, he doubted that there were enough pieces of the specialized commercial body left to start a restoration. 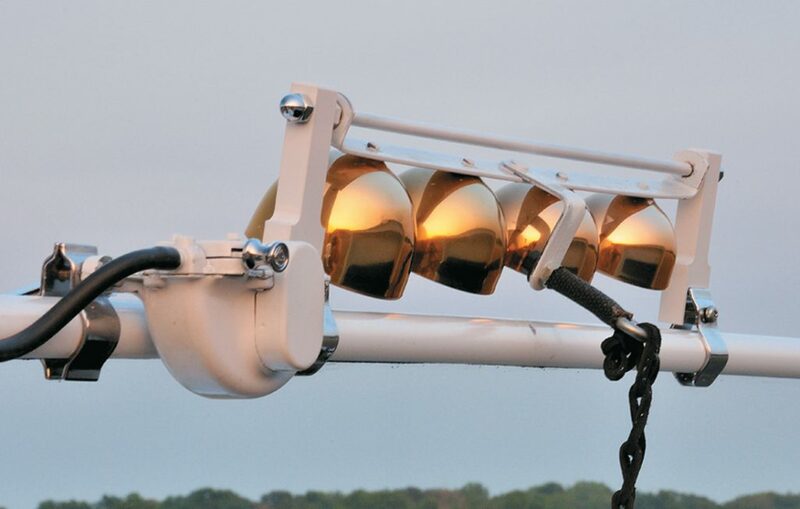 However, he went back for a second look, spread out the parts—some sheetmetal and bits of wood framing—and took photos. After a month of study, he decided that it might be possible to restore the ice cream truck. 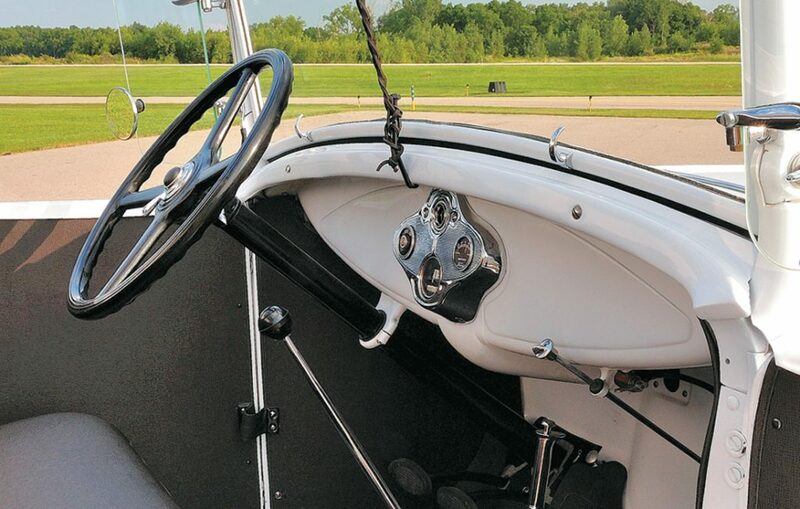 The chassis and the body from the doors forward are stock Ford Model A. Since Hornacek had previously restored two Model As, bringing that part of the vehicle up to snuff would not be a problem for him. The rear ice cream box, built by the Kettle Body Company, was unique and that was the challenge. If there hadn’t been enough of the remaining ice cream box to use as a pattern, restoration wouldn’t have been possible. 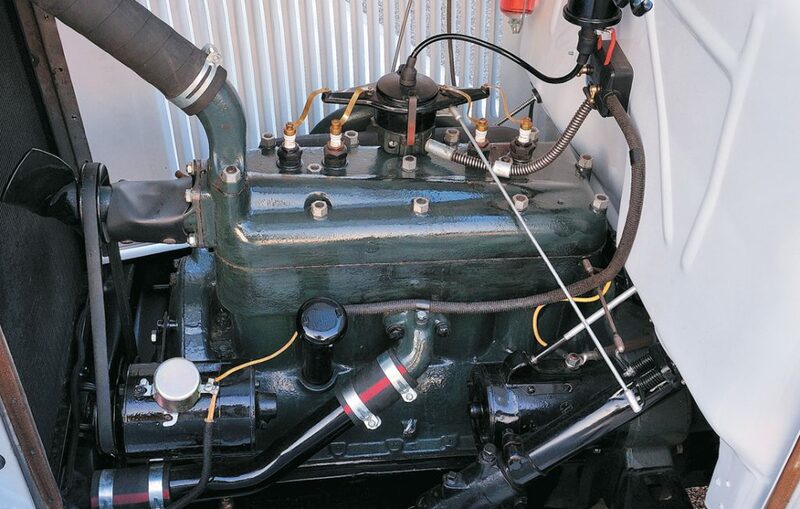 Also aiding in the restoration were photos of a 1930 Model A Good Humors truck from the Smithsonian Institution. Hornacek likes puzzles, and says figuring out how the aged pieces of the ice cream box fit together “was the biggest puzzle I ever tackled. I kind of found it enjoyable when some of the parts came together.” The remaining wood parts were used as patterns for a new frame of ash. 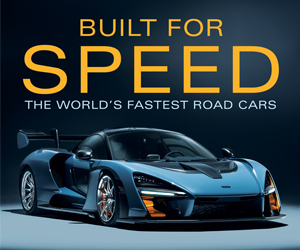 Ash, which is strong and lightweight, was chosen for the replacement parts because Ford (and also custom body builders) used it for body structures. Hornacek kept the box structure square—squarer, in fact, than the original Kettle-built box, which was hacked together. When it came time to attach the sheetmetal, he discovered a two-inch difference between the side panels. The old sheetmetal wouldn’t fit the new frame, so he had to fabricate new sheetmetal parts using the ash body framing as bucks for shaping the new body panels. The ice cream box doors were a challenge in that they were built in three ziggurat-like tiers to form an airtight triple seal. A computer-aided design program was used to recreate the doors. The most satisfying step of the project for Hornacek was putting everything together. Thanks to careful planning and craftsmanship, everything fit as expected. Though he painted the body himself, Hornacek, who is colorblind, let an artist do the lettering. The “s” at the end of “Good Humors” isn’t a misprint. 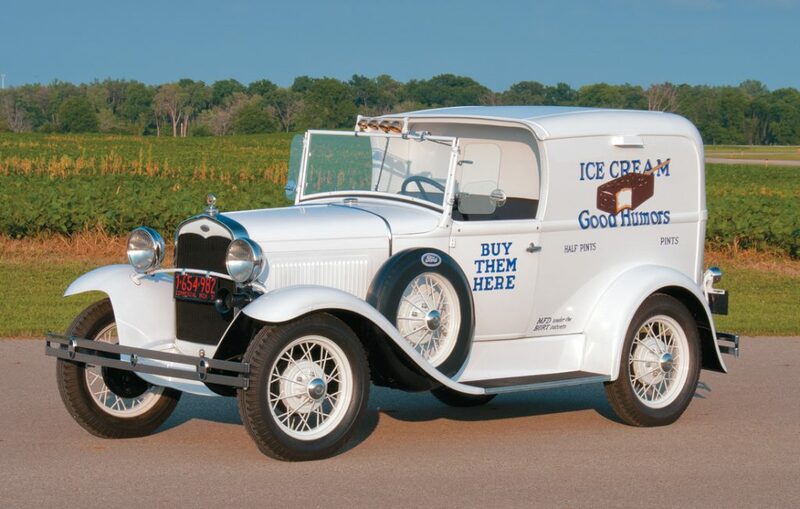 The “s” was part of the Good Humor Ice Cream name until the Fifties. Now that the truck is finished, Hornacek says the most enjoyable part of showing it is seeing ladies smile and children enjoying the ice cream bars that he gives out. The inside of the ice cream box is a yard square and holds 100 ice cream bars and seven pounds of dry ice. (Apparently a salt brine solution was another cooling method used at the time in the absence of mechanical refrigeration.) 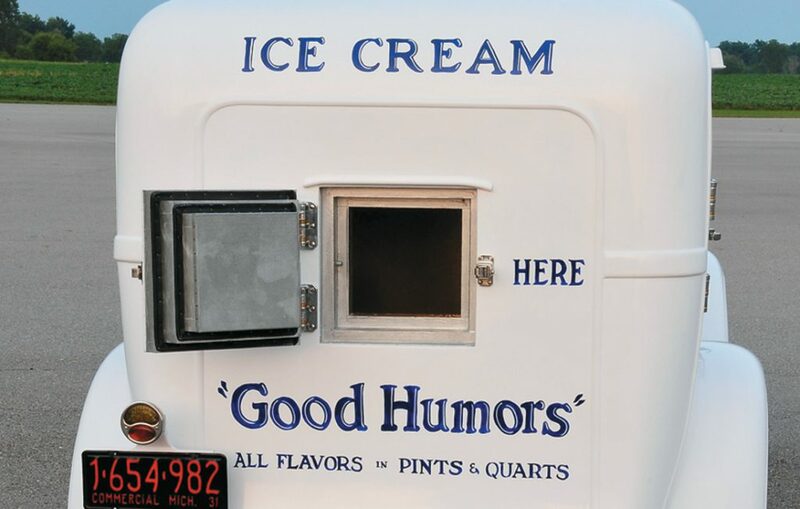 Cork insulation 1.25-inches thick helps keep the ice cream cold for a day, and Hornacek says, “The ice cream bars stay so hard that kids can break their teeth.” The Good Humors truck is a fair-weather vehicle because it has no provision for a top over the driver. When braking, any water on top of the ice cream box dumps on the driver. 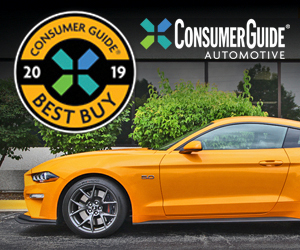 Stationed in Germany during his army service, Hornacek was a mechanic responsible for getting tanks ready for inspection, so he knows how to prepare a vehicle for show judging. 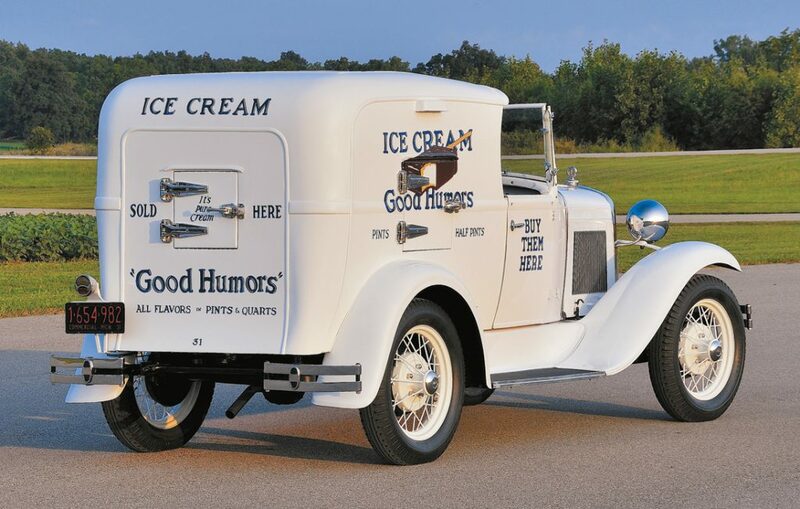 When the Good Humors truck isn’t at a car show, it can be seen at the Model A Ford Museum located on the grounds of the Gilmore Car Museum at Hickory Corners, Michigan. Written by: Guest Author on November 23, 2017.on October 23, 2018.